An experimental use of web based material to supplement the teaching of the course GEC121 – Computing and Information Skills Fundamental I, in the University of Botswana was carried out between August and December 2003 to a class of over 750 students in the Faculty of Social Sciences. The course was taught in a one-hour class, with two-hour lab sessions every week for each student. The face-to-face sessions were supplemented with course outline, lecture notes, laboratory manuals, quizzes and bulletin board on the Learning Management Software called WebCT, while the laboratory sessions were done using only WebCT. 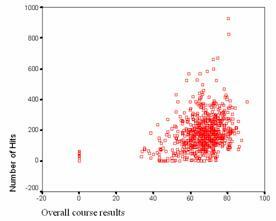 This paper looks at the areas of application of eLearning for large classes and how it was applied at the University of Botswana for the GEC121 course, students and tutors view of the course, as well as experiences from its use. Keywords: Botswana, large class, elearning, blended learning, electronic assessment. Since 2001 the Educational Technology Unit (EduTech) in the Centre for Academic Development (CAD) at the University of Botswana (UB) is spearheading the eLearning initiative to enhance teaching and learning with appropriate use of Information and Communication Technologies (ICT) at the University of Botswana. The definition for eLearning used by the University of Botswana is as follows: "eLearning is the appropriate organisation of information and communication technologies (ICT), for advancing student-oriented, active, open, and life-long teaching-learning processes". This definition is inclusive, encompassing all forms of ICTs such as overhead and digital projectors, power point presentations, video conferencing and online learning, using the eLearning platform WebCT, to name a few. In December 2002, eight eLearning pilots were selected within the University, to serve as best practices for the eLearning strategic rollout planned for 2004. These pilots have been developed in the first six months of 2003 year and follow a blended learning strategy, combining online and face-to-face teaching and learning. All these courses have an online component within the UB WebCT learning Management System. The course "GEC121 Computing and Information Skills Fundamentals I" is meant to instill basic computing and information literacy skills in year one students. This project covers only the computing skills aspect. The GEC121 course uses a blended learning approach, combining face-to-face classes and online learning during the lab sessions. A similar computer literacy course was delivered by Morris (2002) in a purely online form, including submission of all assessments. This approach allows for targeting of learners with different learning orientations or at different levels of learning. The division and sequence of the course was carefully planned based on skills required in the application of theories before the laboratory sessions as well as consideration on skills that were required in one laboratory session in order to complete other laboratory sessions. The 2003/2004 session group had a total of about 750 students. The face-to-face is managed in four (4) groups a week, while the laboratory sessions were divided into 24 groups of 30 students each. In the past various obstacles were encountered teaching this course: The classes are large with over 750 students. There is one lecturer responsible for the whole class and only one demonstrator available during a session of two hours to a group of 30 students. There is no recommended textbook for the students. Photocopying handouts for a class of over 750 is not economical. It is also difficult for one laboratory demonstrator to support a group of 30 students in laboratory sessions with different level of skills and motivation within a two-hour period. Lucas & Hoffman (2000) quoted Moore & Kearsley (1996) as contending that the medium removes some of the less pleasant aspects of face-to-face conversations. Students can ask questions online without disrupting a class. For large classes, eLearning seems to be a solution where students can feel closer to the materials and lecture. Larsen (2000) says one of the major benefits for large enrolment of courses is the help that can be provided for the ‘administrative side’ of a offering course. It provides a great help in assessment management. Some of the highlighted benefits of electronic submission of assessment materials include easy tracking, time-stamped enforced deadlines and easy return to students (Douglas & McNamara 2002). The issue of students claiming they submitted scripts when they did not will be eliminated. This was another major problem faced in previous offerings of the course, and another motivation to use eLearning. For large classes, eLearning seems to be a solution where students can feel closer to the materials and lecture. Furthermore, they have the opportunity to practice outside the laboratory hours. Students with "techno phobia" now have a chance to go over and over the materials till they are confident. The laboratory sessions were purely done using WebCT. Laboratory sessions for the course are mandatory; the students were given orientation on how to make use of WebCT during the second laboratory session. The first session was dedicated to getting familiar with the computer environment itself. This was done by the course demonstrators who had to be given initial orientation on the use of WebCT. The students from then were expected to get their instructions from WebCT. This section deals with the actual use of the course. WebCT kept track of students’ visits and activities on the Web. The content is broken down into small learning nuggets, so that students can grasp the concepts with ease. Each module has a clear objective. Pages use headings and subheadings. Where possible text is substituted or accompanied by graphics and animations to clarify concepts. All pages share the same basic layout grids, graphic themes, editorial conventions and organisational hierarchies. Texts are divided into smaller chunks. Analysis of the use records show that the laboratory modules were used much more than the lecture modules as shown in Figure I. This is probably because the lecture modules have a face-to-face supplement while the laboratory module does not. The use of the lecture module declined over time, while that of the laboratory session increased and only declined towards the end of the course. Students also used more of the content module when it was referred to in class. Experiences with online courses seem to show that it facilitates interaction among students, with content, and between students and instructors (Pennsylvania State University n.d.). Within the system designed, there are two different ways for students to communicate with the lecturer, the laboratory demonstrators and colleagues: the email tool and the discussion forum. The email tool allows the student to send an email to a selected person or group. The lecturer sent a total of three (3) messages to all the students. One of such messages was sent after the mid-semester, it was a note through email to find out how the students were doing. The responses received were quite re-assuring. It showed that the students were learning and enjoying the course. They used such phrases as ‘great’ ‘interesting’ ‘no problem’, ‘thanks’, ‘fine’, ‘doing well’, ‘benefiting a lot’. During the course, a total of 122 messages were received from the students, ranging from personal well wishes, as well as questions about the assignment and examination. The discussion forum is divided into sub-topics reflecting the modules of the course. It also has another section divided by the student’s laboratory groups. The sub- topics serve mostly as Frequently Asked Questions pools to assist laboratory demonstrators and the lecturer in answering students’ questions. The discussion forum allows the student to post or respond to a message, which can be read by everyone and responded to by everyone. Students were also divided into groups to discuss on various applications of computers based on their laboratory group using the discussion forum. Each student was expected to post a minimum of 1 item to the discussion group. 21.3% posted nothing, 52.7 posted the minimum and only 26.2% went beyond the minimum. The table I show the details of postings done by the students. Table II shows how students read the postings to the discussion forum. The result shows a lot of students were silent readers. 55.3% read between 6 and 234 items in the discussion thread. 24% did not read anything, which is about the 21.3% that did not post any thing. The discussion forum was probably not fully utilised because there were no marks allocated to student’s contribution to the forum. There was therefore no motivation for the students to use the forum. As part of the course, students were asked to submit their assignments through the system. Over 99% of the students managed to submit. It was during this the submission exercise that the few students who had never used the system were discovered. The assignments were graded and students were given feedback through the system. The Self-Tests are designed as a set of about fifteen (15) multiple choice quizzes to be used after each module. Students are given immediate feedback on wrong and right answers. Self-tests are used to help the students know how well they have grasped the concepts. Table III shows that most of the students (91.4%) used the self test less than four (4) times. There were no scheduled times to use the self test. It was not compulsory. Students had to do it at their own convenience. This was probably not fully utilised due to lack of enough computing resources. At the end of the course during the last laboratory session, online questionnaires were administered to students, 477 students responded to this questionnaire. A focus group discussion was done with eight (8) randomly selected student volunteers by the Educational Technology Unit, the department coordinating eLearning for the University. A look at the quantitative data in the online questionnaire revealed that 67.9% agreed that it was easy to navigate, 56% felt the design of the course was ‘just Ok’ and 39.8% really liked the design of the course. 60% of students felt that the amount of material in the course was just enough, while 35% felt it was too much. 93.1% felt the presentation was very useful and 78.4% agreed that it met their learning needs. 92% agreed that it made the course better. 57.4% of the students said that the tutors were helpful. Students were asked what they liked and what they did not like about the online course. The responses were then re-categorised and results are as shown in tables IV and V. The results show that students liked a whole range of things about the course. About 8% said they liked everything about the course. The students liked the contents best. The other things that stood out in what they liked include email, practical laboratory session and the self-assessment questions. student did not like about the course. The major complaint was that access was difficult. The report from the focus group discussion showed that students agreed that the WebCT part of the course helped a lot. WebCT was found to be very user friendly and easy to navigate. It made interesting by the practical sessions, it assisted students in other courses because they were able to type other assignments. Overall they feel they were comfortable with computers and have learnt a lot. Difficulties encountered included the fact that time was not enough, computers were not enough for further practice, most students don’t pay attention in class because they know they would get notes on WebCT, and WebCT outside UB is very slow to open . Students confirmed that they did get enough support from the lecturer. They were able to communicate using email, though not as often as they would have wanted. This is due to the limitations in the number of computers available. They however requested that laboratory demonstrators should have more patience for the sake of those who had no previous experience in computing. ANY RELATIONSHIP WITH FINAL ASSESSMENT? At the end of the semester, a final examination was given which was a set of multiple-choice questions. This result and two assignments make up the overall course results. Overall, 94.6% of the students passed. The results as shown in Table VI show that there is a very high correlation between the course results and the number of pages visited, the number of hits as well as the visits to the discussion forum. In comparing the final examination result with the number of hits and pages visited, a scatter diagram was drawn as shown in Figure II. This confirms that the exam marks are closely related to how many sites were visited, how many times the student used the site, as well as how well he visited the discussion group. The self-test module and postings done had no significance to the overall course result. This is likely because the self test module was not well used by the students (See table III). Berger (n.d.) however, argues that this correlation might not mean anything, that the real independent variable is probably motivation and the lasting effect on student overall performance which is hard to determine in this study. What makes WebCT work more than anything is the support (Miller 1999). Support is crucial every step of the way. Educational technology department dealt with student accounts to use with the software package. The Faculty Information Technology Unit supported the computers. Laboratory Demonstrators were there during laboratory session to assist students. I felt communication with students was much better than I have experienced in previous years with the course. It was possible to respond to more students needs at individual levels through e-mail. I also felt the topic various applications of computers using the discussion forum were better covered than it would have been in a one hour class. There was also evidence that student read postings by other students. Luckily, out of the five laboratory demonstrators, three had taught without eLearning the previous year. An interview with this three to find out what they felt about the use of eLearning showed they were very enthusiastic. They felt the students had a better grasp of the course and could use the computers more comfortably than students from the previous year. They also confirmed that they were able to manage the laboratory better with fewer questions, this they attributed to the fact that the students had the instructions in front of them. Course Assessment was also another area that was quite beneficial. Collection was better and easier through electronic submission. We eliminated the problem of missing scripts. Marking was more thorough. It was easier for us to detect student mistakes in the electronic version which we would not have detected in the paper copies – for example when students were asked to use the header/footer feature in Microsoft Word, we could detect if this was used or if they simply typed what they were asked to do at the top of the page. It was also easy for us to give a detailed feedback to the students through the system. Each student when they check their scores will find a detail on how the work was marked by section, and also comments on what mistakes they made. We had a template which we copy and paste to each student’s remark section and then fill it in for that particular student. It was almost an impossible task with the manual marking; it was also a difficulty distributing the paper back to the students. It also provided the advantage that there was to time spent having to record 750 student’s assessment, which is also error prone in that some student’s scripts were accidentally skipped in the past. This was done into the system as the marking was done and at the end we could export the marks into an Excel Spreadsheet. Overall, I felt satisfied with the course. Students used the materials extensively. They learnt more skills than were required in the syllabus. I could sense I was dealing with confident students. This is quite different from previous years where some students will complete the course and still have ‘techno-phobia’. Within a few weeks students had learnt to switch between screens and use the eLearning materials as their reference. I also had many appreciative students who sent comments about the course through e-mail. This is also in line with Berger (n.d.) finding when he experimented with web-based material to support a large class. He concluded he had a better rapport with his class; he was able to easily respond to student questions, there was strong correlation between web use and final marks. Solving the problem of missing scripts also created another problem with students submitting wrong files and blank files. This created some management problems of allowing students to re-submit and in some cases, it was after the student results were out that they realized that they got a zero (0) in the assignment. Such students were allowed to re-submit and the dates the files were created checked that it was not beyond the deadline. Though the electronic assessment had its own benefit, it actually needed more time to mark than the paper version. This is partly because of the added time it takes to open and close a file. There are also additional things to check, for example the view the student saved the file will determine if you would see the header and footer. This might mean changing the view before marking. Other things that could have added to the time included the individual comments given on each marked script as well as some students not following instruction. As a backup, in the event WebCT goes down, there is a paper version that could be photocopied for the students. This fortunately happened only with one group, once through the semester. So it was easy to organise a make-up for the group. Also, when students submitted assignments, a back-up was downloaded on a stand- alone machine in case there is a network problem during the marking period. This actually occurred, but it was for a short period, and so we did not have to use the back-up copy. The use of eLearning in the course did provide great help. The same course is now been used for August to December 2004 for a new batch of students. Due to its usefulness, it has also been adopted by all faculties in the University. The current population using it is over 3000 students. eLearning is no substitute for what is done in lectures but is a very useful support tool. The used of eLearning for the class did support the views in literature on the benefits found in literature about large classes. Some advantages it provided were based on the fact that activities are independent of time and place. This created greater freedom for students. Apart from during classes, they could log in any other time and examine their course and laboratory session as well as take part in any available online discussion. WebCT also provided the ability to track assignments submitted and assessed. It also provided a way of easy feedback for the students. Other advantages from using the course included more interaction with the students through email and online discussion. It was easy to manage students’ assignments. There was also enough evidence that students felt it added value to the course. 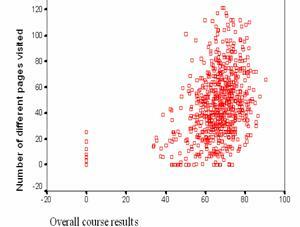 There was also a strong correlation between its use and overall course results. Although it provided benefits, it is apparent that to use it students need to have access to computers where they could have access to the materials. There is therefore the need to ensure a reasonable student to computer ratio. There is also the need for provision of adequate technical support for it to be successful. There should be adequate support staff for hardware, software and training. There is need to have a ‘back-up’ plan for delivery as well as assessment in case there is a problem with the system. This could include provision of paper copies for laboratories or having off-line versions on compact disk for delivery, as well has off-line versions of the assessment, in case there is a network failure. Assessments should be well planned. There should be a ‘back up’ plan for students who submitted wrong copies or blank files. There should also be enough more time allocated to the marking of assessment to allow a detailed feedback to the student. Discussion groups should be well planned and probably carry some marks in the overall course result to motivate students to use it. Provision could be made during laboratories to allow students to fully utilize the self assessment tools. Eyitayo, O.T. & Giannini, D. (2004). "Instructional Support and Course Development for Computer Literacy Course: Using Anchored Instruction". In Procceedings of IASTED International Conference on Web-Based Education, pp 206-21, February 16-18, 2004, Innsbruck, Austria. (ISBN: 0-88986-406-3). Larsen, L., (2000). "Enhance Large Classes with WebCT". Available at: http://www.oit.umd.edu/ItforUM/2000/Fall/webct/ (Accessed January 16, 2003). Lucas, G. & Hoffman, B. (1998). "Module 1: Strategies and Tactics for Online Teaching and Learning" Available at: http://www.edweb.sdsu.edu/T3/module1/Connect.htm (Accessed January 16, 2003). Moore, M.G. & Kearsley, G. (1996). Distance education: A systems view. Belmont, CA: Wadsworth Publishing Company. Morris, M.S. (2002). "Lessons learned from Teaching a Large Online Class teaching" Curriculum and Instruction 505, Spring 2002 Available at https://webct.ait.iastate.edu/ISUtools/webhtml/designer/community/morris.pdf (Accessed January 16, 2003). Miller, G. (1999). WebCT Responds to Campus Need for Online Teaching Resources (1999) Available at http://www.inform.umd.edu/UA/UnivRel/outlook/1999-02-16/feb-16-99/webct.html (Accessed September 1, 2004). The Pennsylvania State University (n.d.) Large Class FAQ: Technology http://www.psu.edu/celt/largeclass/faqtech.html#3.